Do you ship NeuroBlaster party pills to California? How much will cost the shipping? 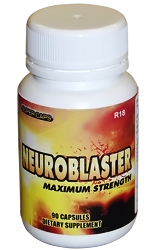 If you order 3 bottles of NeuroBlaster you will pay only $165.00 and you will be able to choose free shipping by Airmail. The shipping costs and available shipping methods may differ depending upon the items in your shopping cart and your location (for some orders we offer free shipping). To see available shipping methods for your order and estimate shipping costs, please add products to your shopping cart, click on “Checkout” and select your country. Can I take NeuroBlaster when I drink energy drinks? NeuroBlaster contain Green tea extract, which contain a variety of compounds including natural caffeine. An energy drink is a type of beverage containing stimulant drugs, chiefly caffeine. So, if you take both NeuroBlaster and energy drink, there is a possibility to consume too much caffeine. Consumption of 1,000–1,500 mg per day is associated with a condition known as caffeinism (it usually combines caffeine dependency with a wide range of unpleasant symptoms including nervousness, irritability, restlessness, insomnia, headaches, and palpitations after caffeine use). Caffeine overdose can result in a state of central nervous system over-stimulation called caffeine intoxication. This condition typically occurs only after ingestion of large amounts of caffeine, well over the amounts found in typical caffeinated beverages and caffeine tablets (e.g., more than 400–500 mg at a time). The symptoms of caffeine intoxication are comparable to the symptoms of overdoses of other stimulants: they may include restlessness, fidgeting, anxiety, excitement, insomnia, flushing of the face, increased urination, gastrointestinal disturbance, muscle twitching, a rambling flow of thought and speech, irritability, irregular or rapid heart beat, and psychomotor agitation. In cases of much larger overdoses, mania, depression, lapses in judgment, disorientation, disinhibition, delusions, hallucinations, or psychosis may occur, and rhabdomyolysis (breakdown of skeletal muscle tissue) can be provoked. When taking party drugs and energy drinks, please read the label. If they both contain large amounts of caffeine, please take them separately to avoid caffeine overdosing. The risk of death because of too much caffeine is relatively small. If caffeine kills you, it usually does because you have a heart disease or have taken it along with another pharmacologically active substance, at least this is what I’ve read. It’s always better to play safe, though, and consume caffeine moderately, because we don’t have enough knowledge to proclaim we know everything about what this chemical compound can do to our bodies. I see that this product contains L-Theanine. There are scientific studies about taking L-Theanine along with caffeine. Because L-Theanine is able to cross the blood–brain barrier, it has psychoactive properties. L-Theanine has been studied for its potential ability to reduce mental and physical stress, improve cognition, and boost mood and cognitive performance in a synergistic manner with caffeine. Gomez-Ramirez, Manuel; Higgins, Beth A.; Rycroft, Jane A.; Owen, Gail N.; Mahoney, Jeannette; Shpaner, Marina; Foxe, John J. (2007). “The Deployment of Intersensory Selective Attention”. Clinical Neuropharmacology 30 (1): 25–38. doi:10.1097/01.WNF.0000240940.13876.17. PMID 17272967. Kimura, Kenta; Ozeki, Makoto; Juneja, Lekh Raj; Ohira, Hideki (2007). “L-Theanine reduces psychological and physiological stress responses”. Biological Psychology 74 (1): 39–45. doi:10.1016/j.biopsycho.2006.06.006. PMID 16930802. Park, Sang-Ki; Jung, In-Chul; Lee, Won Kyung; Lee, Young Sun; Park, Hyoung Kook; Go, Hyo Jin; Kim, Kiseong; Lim, Nam Kyoo et al. (2011). “A Combination of Green Tea Extract andl-Theanine Improves Memory and Attention in Subjects with Mild Cognitive Impairment: A Double-Blind Placebo-Controlled Study”. Journal of Medicinal Food 14 (4): 334–43. doi:10.1089/jmf.2009.1374. PMID 21303262. Haskell, Crystal F.; Kennedy, David O.; Milne, Anthea L.; Wesnes, Keith A.; Scholey, Andrew B. (2008). “The effects of l-theanine, caffeine and their combination on cognition and mood”. Biological Psychology 77 (2): 113–22. doi:10.1016/j.biopsycho.2007.09.008. PMID 18006208. Raloff, Janet (September 29, 2007). “Distracted? Tea might help your focus”. Science News 172 (13): 206. doi:10.1002/scin.2007.5591721319. John J. Foxe of the Nathan S. Kline Institute for Psychiatric Research in Orangeburg, N.Y., and his colleagues recruited 16 people for tests of attentiveness on four days. Before testing, each individual drank a glass of water. On 3 days, the drink was spiked with 100 milligrams of theanine, 60 mg of caffeine, or both. The theanine dose was equivalent to that in 4 to 5 cups of tea, and the caffeine translated to about 2.5 cups of tea. In the difficult tests, participants watched a computer screen and pressed a button when a designated shape appeared on the side of a busy visual field to which an arrow had previously pointed. Participants’ accuracy differed little between days when they got water alone or with only one additive. Accuracy improved dramatically, however, on the day that they got the theanine-caffeine combination. The attention benefit lasted throughout the 3 hours of testing. Owen, Gail N.; Parnell, Holly; De Bruin, Eveline A.; Rycroft, Jane A. (2008). “The combined effects of L-theanine and caffeine on cognitive performance and mood”. Nutritional Neuroscience 11 (4): 193–8. doi:10.1179/147683008X301513. PMID 18681988. Einöther, Suzanne J.L. ; Martens, Vanessa E.G. ; Rycroft, Jane A.; De Bruin, Eveline A. (2010). “L-Theanine and caffeine improve task switching but not intersensory attention or subjective alertness”. Appetite 54 (2): 406–9. doi:10.1016/j.appet.2010.01.003. PMID 20079786. Giesbrecht, T.; Rycroft, J.A. ; Rowson, M.J.; De Bruin, E.A. (2010). “The combination of L-theanine and caffeine improves cognitive performance and increases subjective alertness”. Nutritional Neuroscience 13 (6): 283–90. doi:10.1179/147683010X12611460764840. PMID 21040626. Kelly, Simon P.; Gomez-Ramirez, Manuel; Montesi, Jennifer L.; Foxe, John J. (2008). “L-theanine and caffeine in combination affect human cognition as evidenced by oscillatory alpha-band activity and attention task performance”. The Journal of Nutrition 138 (8): 1572S–1577S. PMID 18641209. Do you package and mail your parcels discreetly? Like, will the name of your company appear on the outside of the parcel?